Toners are water- based liquids composed of some specific active ingredients like plant extracts and essential oils. Most toners cater to a variety of skin types. Toners look like water and act like water. It is a fast penetrating liquid that provides the skin with quick hydration and also helps to remove any dead cells from the surface of the skin leading to plump, glowing skin. Toning is an essential step in any healthy skin care regimen. It is just as crucial as cleansing. They have also categorized as hydrating tones, calming and soothing toners and astringent tones. They are also categorized as pH balancing toners and cleansing toners. A toner is used to complete the cleansing of the skin by removing dust, pollution and impurities that are present even after washing the skin with cleanser. Cleansers usually contain oil that leaves a film on the face. Toner is like a primer for the skin care routine just like serums and moisturizers. Toner is used to shrink the appearance of pores. Toners are also used to remove makeup residue. Some well -known toners include chamolile toner as it has hydrating, clarifying and energizing properties. This toner is wonderful for calming and soothing effect on the skin. .
For oily skin, there are astringent toners which have alcohol as the main ingredient. They dry out the skin and make its antibacterial. . The newest generations of toners are mainly alcohol- free but still have astringent properties. The toners available now address to almost every skin problem and just not for acne and oily skin. Depending on the toner, it may contain acids, glycerin, antioxidants and anti- inflammatory. .
Toners can be considered as a prep for the pores. They bring back skin to its natural acidic state, by removing any leftover impurities and making the skin a better absorbent. .
A toner is to be used after cleansing and exfoliating the skin. It should be used right away after a through cleansing is done as most molecules penetrate the skin better when it is wet. After toner, one can use serums, eye creams etc. Planet Ayurveda offers the most effective cleansing toner in the form of ROSE TONER .The toner is manufactured in the serene location of the Himalayan Mountains in a GMP certified unit. 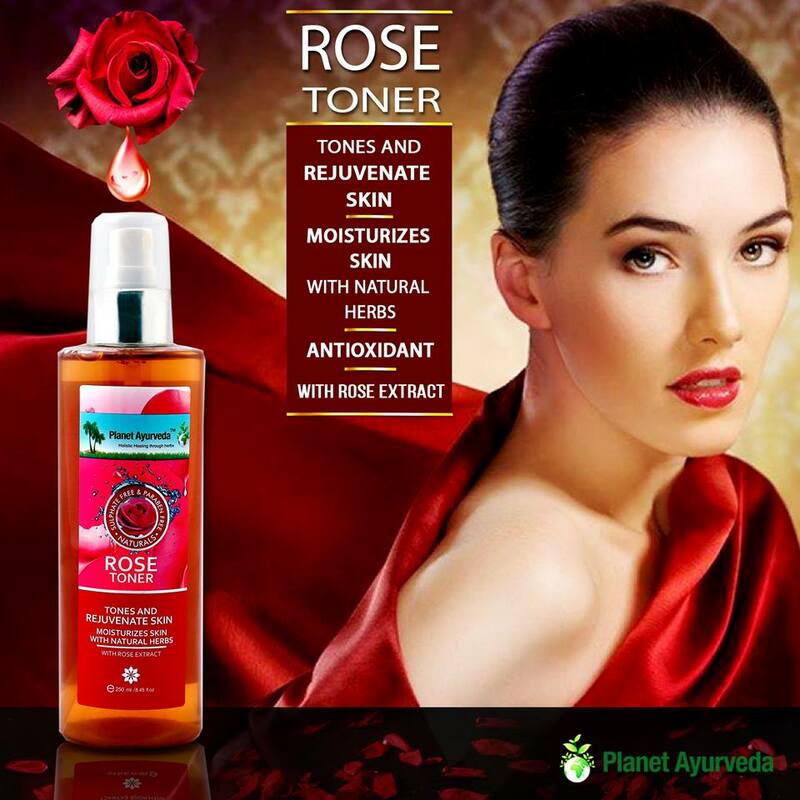 The Planet Ayurveda’s ROSE TONER is manufactured using ingredients like mint oil (pudina) ,green tea extract , Rose oil, Iscaguard PEG, Rose extract , color and aqua. The ROSE TONER provides the most needed hydration to the skin thereby giving it radiant appearance and a refined complexion that everyone wants. The toner is useful in providing a fresh looking, glowing skin as it rejuvenates the skin completely and provides elasticity to the skin. The Rose toner restores the pH of the skin. It normalizes the skin tone, revitalizes and moisturizes the skin, helps in strengthening the skin cells and regenerating skin tissues. The ROSE TONER acts as a barrier to protect the skin against free radicals. How To USE Rose Toner? The ROSE TONER needs to be applied after cleansing with warm water. It is advised to splash the face with cold water and then use the toner. One needs to mist 3-4 pumps of cucumber toner directly on the face and pat it on using palm or cotton pads. The toner should be left to dry and later wiped off with the cotton ball. The toner can be used once in the morning to remove sebum produced during the night and to balance the skin’s pH and should be used in the night to complete the cleansing of the skin. Always apply the cream or any other treatment product after using a toner. The toner works equally well on all types of skins from normal to sensitive skins. It helps with providing all- day hydration to the skin thereby it is recommended as a solution to the dry and tired skin. It helps in treating skin pores, wrinkles, aging signs, dullness and uneven texture. The toner promotes the healing process and diminishes blemishes left over from any wound or scar. The mild properties of ROSE TONER calm the skin while acting as an astringent. The Vitamin A and Vitamin C in rose toner formulations help in calming the skin. The ROSE TONER has been prepared according to the Ayurvedic principles by MD Ayurveda expert Dr. Vikram Chauhan in India. The product is devoid of any harmful sulphates, parabeans and chemicals. The colors and ingredients used are natural plant extracts emitting natural aroma and soothing effects on the skin. The product colors are 100% natural and made as per the European Standards. The ROSE TONER is easy to use the product and should be used by both men and women. It is the most common skin soother. Incorporating a natural toner like ROSE toner is a smart way for anyone who is concerned about using the purest formulations on their skin. It is light and fragrant toner to be used for all skin types. Rose water itself has anti- inflammatory properties that can reduce redness of irritated skin and get rid of acne, dermatitis and eczema. It acts as a great cleanser and aids in removing oil or accumulated dirt from the clogged pores. It stops the growth of bacteria due to its mild astringent qualities. It prevents and calms the sun burn. It is also useful as makeup remover. The fresh floral scent of ROSE TONER is refreshing and works as a great mood booster. It gives instant energy. To make a toner at home, you can add a spoon of honey to one cup of green tea. In this, you may add some jasmine essential oil and store the mixture in a cool place. Another way to make toner is by mixing one lemon with a spoon of apple cider vinegar and some water. This should be put in an airtight container and stored in a cool place. Toners are very important as they help in fighting aging, ache and redness on the skin. The simplest and best home remedy is to use cold water or ice cubes on the face. Tones can be used from head to toe to refresh and revitalize the skin’s surface.